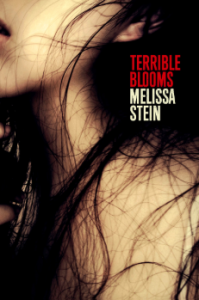 Melissa Stein’s title, Terrible Blooms, is good on its promise to weld the grotesque and the lovely so tightly and repeatedly that they transcend simple paradox and make of pain a single luminous skein. The poem “blessings,” for example, takes the form of a prayer comprised of repeated “may you . . .” clauses wherein each expectation of a “blessing” resolves in an image more suited to curse. The largely pastoral images are so sharp and visceral, they often hurt: “may barbed wire tear off/ the snouts of your pigs.” The clauses are packed into a column with justified right and left margins, a formality that contrasts sharply with the fluid lyric’s songlike surfaces: “may the milliner/ embroider your bonnet with/ nettles the blackberry fell your/ dog.” While the poem largely wishes revenge on an addressee, by the end, the addressee also seems to be the self: “may the wolf/ carry off the heart of your heart/ and the swans swim thrice by/ your grief.” Form and meaning contradict each other to pressure this pain into something magical, if not exactly hopeful. In “Birthstone,” violence is drawn in the first lines with the merest suggestion, “Facedown in carpet,/arm pinned behind me” and doesn’t appear directly again as the images widen out to include gemstones, a mother in a kitchen, the taste of nasturtium, until we reach the floured dough’s “shagged fist.” Whether the violence is physical or mental matters little: how intensely it’s felt is everything here. Lush sets of images in these poems are sometimes drawn from anachronistic contexts, in “Heir,” the trappings of medieval life, chalices, ermine, a crypt, while in “Birthstone,” the context for many of the images is a 1950’s kitchen wherein a speaker is wearing “an apron, edged/ in rickrack,” and there are “pinking shears,” and a “jade milk-glass mixing bowl.” While the speakers’ pain in both poems feels entirely contemporary, the context shifting deflects it through the details of other times and places and renders it more mythical. In “Dead Things,” the voice grows more direct, perhaps autobiographical, and we understand that one source of pain is the loss of the speaker’s mother. The poem builds to that loss in three parts, the first addressing childhood experiences of dead creatures, the second a hawk hunting, and the third, the deathbed of the mother, her last moments of consciousness missed by the accident of a late plane. More often, though, the grief that drives these poems is present by omission. In “Thanksgiving,” a young family driving icy roads seems safe in “The night, the plow, the street,” but the final lines “grant them safe passage./ At least on this inviolate page,” suggest that the safety we’ve ridden in for the entirety of the poem is, after all, an illusion, and even if this family has not come to harm, the possibility that they have or will is ever open. The voice of “Dead Things” does not return fully until section two’s “Seven Minutes in Heaven,” where two contexts separated in time run concurrently, the first reveling in details of an urban foodie experimenting with curing sausages in a basement, and the second a tally of adolescent sexual adventures that might have taken place in the same basements years before. Key to the poem’s placement here is the realization that “it takes a long time to realize/ your suffering is of very little consequence/ to anyone but you.” And that realization leads to the speaker’s opening to the possibility of having children, a possibility that surfaces briefly in a number of the poems. Immediately following that more expansive and expressive piece, a series of smaller, spare lyrics return to the imagery of the first section, dogs, meat, a cave, physical desire’s animal hungers, all brief but intense flares of mixed emotion. One wonders if these contrasts of the brief lyrics and the more expansive autobiographical mode don’t actually intend to shake a reader’s faith in the “truth” suggested by the mode itself–much the way Lynn Emanuel in her classic work The Dig chastises the reader at intervals for making assumptions about the speaker’s autobiography, for believing in fictions that feel real precisely because they’re embedded in narrative and compelling sensual detail, though finally, it’s the lyric’s sheer emotional force that takes us in. The poems I admire most in this book are those like “Playhouse” that feature subtle patterns for the ear, in this case lyric remnants of what sounds like a children’s song, “Chokecherry, thimbleberry. All summerlong” and “crimson, bruise, amber,/ brick, copper, cinnamon.” The recurring “m,” “b” and “c” consonants and the “on”/”er” rhymes in those lines are interlaced, the “m” sounding in “crim-/amb” of the first half and finishing on “cinnamon;” the “b” in “bruise/amber,” the “c” in “crim/cop/cin,” the “on” in “son/mon,” and the “er” in the amber/copper. The images echo each other as well, the reds in crimson/brick, and the golds in amber/copper blended in “bruise” and “cinnamon.” The list of descriptors applies to a “a patchwork of leaves” the children make as their parents raise voices off the page, so we experience the “patchwork” here as both emotional violence and emotional repair, but the same materials of color and sound comprise them both. Poems sharing the title “Quarry” occur in each of the book’s four sections, as do lyric poems framing moments of a storm’s approach: quarry—as noun, but also verb, as to extract material from a site. Like the emotional center in the collection as a whole, the quarry is a refreshing and deep body of water in which the characters swim, but its depths also hide refuse and violence. We can’t see what dangers lie in the gouged earth, but we’re always aware they are down there. In “Vitrine,” we see a family holding “ordinary/ menace in our hands,” the poem’s speaker, as elsewhere in the book, taking refuge in the pastoral context of bees, a forest, a garden, but the poem’s final section miniaturizes the entire context and transfers it into a “sea in a vitrine,” reminding us that the mesmerizing lyric surfaces of these poems are often just that, curios in a cabinet that remind us of escaped intensity. The rhymes in “Clerestory,” a sestina, are particularly inventive and keep the “terrible blooms” contrast active with pairings like “army/clerestory” and “wire/scar.” Stein makes the sestina form more flexible by allowing one of the six repeated end words to repeat as rhyme sound rather than as whole word, so “me” becomes “army,” “enemy,” “symphony,” “testimony,” and her gift for choosing words for their sounds and letting meanings gather around the result is on full display. Stein is at her best when she’s letting her ear lead, as she does in so many of the brief, lyric pieces in this book, but Terrible Blooms is not only a pleasure for the ear. It manages to “Write several selves to dissolve the bounded idea of the self” (Rachel Blau Du Plessis, The Pink Guitar (1990: 149), and Stein’s visceral and vivid images charm the reader into inhabiting them simultaneously. Leslie Adrienne Miller’s sixth collection of poems is Y from Graywolf Press. Her previous collections include The Resurrection Trade and Eat Quite Everything You See (Graywolf), Yesterday Had a Man In It, Ungodliness and Staying Up For Love from Carnegie Mellon University Press. Miller’s poems have appeared in Best American Poetry, American Poetry Review, Antioch Review, Kenyon Review, Harvard Review, Georgia Review, Ploughshares, and Crazyhorse. Professor of English at the University of St. Thomas, she holds degrees in creative writing and literature from Stephens College, the University of Missouri, the Iowa Writers Workshop, and the University of Houston.